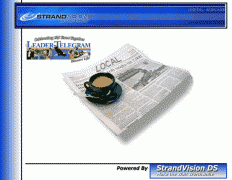 StrandVision Digital Signage has many standard types of digital media content available for your digital signage pages. Additional ones can be quickly and cost effectively created by contacting us at 715-235-SIGN (7446). Our system has multiple user levels. The following color codes show when each setting appears. The Company Information page displays the company name, address, phone, fax and website content that you set up in the Profile Settings area. This is an optional add-on service provided by StrandVision Digital Signage. The Company Descript/Mission page displays the company description or company mission/vision that you entered in the company background area. 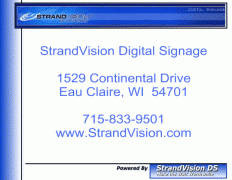 This is an optional add-on service provided by StrandVision Digital Signage. The Company Hours page displays the business hours for this location. This is an optional add-on service provided by StrandVision Digital Signage. The Company Logo page displays the the company logo that you set up in the company background area. This is an optional add-on service provided by StrandVision Digital Signage. The Weather-Current Condition page displays the conditions for the zip code that you set up in the Profile Settings area. If you enter `$name` in the title, it will be replaced by the city. This is an optional add-on service provided by StrandVision Digital Signage. The Weather-5 Day Forecast page displays the forecast for the zip code that you set up in the Profile Settings area. If you enter `$name` in the title, it will be replaced by the city. 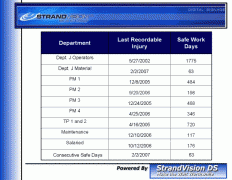 This is an optional add-on service provided by StrandVision Digital Signage. The Weather-Radar page displays the radar for the zip code that you set up in the Profile Settings area. If you enter `$name` in the title, it will be replaced by the city. This is an optional add-on service provided by StrandVision Digital Signage. 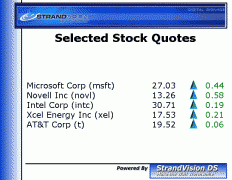 The Stocks-Summary Quotes page displays the last price and amount of change for up to five stocks that you specify by their NYSE or NASDAQ symbol. Click on http://finance.yahoo.com/l to lookup a symbol name. This is an optional add-on service provided by StrandVision Digital Signage. The Stocks-Detailed page displays detailed open, close, last and change in price, the day's price range and the 52 week price range for a stock that you specify by their NYSE or NASDAQ symbol. If you enter `$name` in the title, it will be replaced by the stock company name. Click on http://finance.yahoo.com/l to lookup a symbol name. This is an optional add-on service provided by StrandVision Digital Signage. 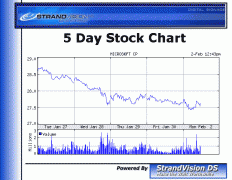 The Stocks-Chart page displays a 5 day chart for a stock that you specify by their NYSE or NASDAQ symbol. If you enter `$name` in the title, it will be replaced by the stock company name. Click on http://finance.yahoo.com/l to lookup a symbol name. 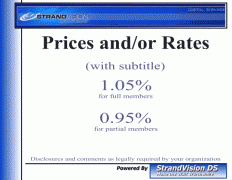 This is an optional add-on service provided by StrandVision Digital Signage. The Currency Rates page allows an international currency to be displayed based on either the daily 12 noon buying rates in New York (certified by the New York Federal Reserve Bank for customs purposes) or alternatively from the Bank of Canada. The rate that displays can be marked up by a certain percentage as well. A disclosure comment is available in small print for up to 2 lines to address legal issues regarding the currency. The data were obtained from sources believed to be reliable but there is no guarantee of their accuracy, completeness or correctness. This is an optional add-on service provided by StrandVision Digital Signage. Useful for displaying one or two prices for stores or interest rates for financial institutions. It is most suited for one product or service with different pricing based on membership, etc. A description for each price discussing the reasons for the differences. A disclosure comment is available in small print for up to 2 lines to address legal issues regarding the pricing and/or discount. This is an optional add-on service provided by StrandVision Digital Signage. 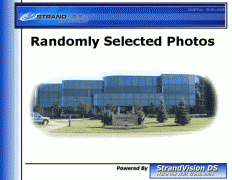 The Random Photos / Images page randomly displays one of up to ten available photos or images. 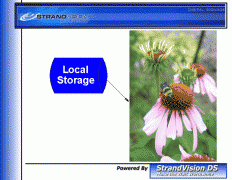 Files are uploaded to the StrandVision Digital Signage server. If there is only one image specified, it will always be displayed. If there are more than one, the photo will be different each time the page is displayed. The Multiple Photos / Images page displays all of the available photos or images before advancing to the next page. The Remote Photo / Image page displays a photo or image from a web site url. This can also be used by systems integrators to read from the player's hard drive. This is an optional add-on service provided by StrandVision Digital Signage. The Paragraph-Fixed page displays several lines of information on the screen with an optional photo or image. The text is auto-sized to fit in the available screen space. If there is a lot of text, select the scrolling paragraph. The Paragraph-Scrolling page has a scrolling display where unlimited lines of information is displayed up or down on the screen. The speed can be changed to reduce the time it takes to display all the information. This is an optional add-on service provided by StrandVision Digital Signage. Allows an XML / RSS feed from another web site to be used. Please ensure that the site allows your legal use of their information. Any site that has the or symbol or other RSS feed can be used. To add a username and password, enter the url as http://username:password@url. Click on the XML or RSS feed button, copy the url at the top of your web browser into the RSS Feed URL below. The server will retrieve this information and will randomly select one of the items when the page is displayed. $rssfeedoptions$ This is an optional add-on service provided by StrandVision Digital Signage. Allows an external web site to be displayed as an image. Any web page can be captured and you can display the full page or select a specific region of the page. To add a username and password, enter the url as http://username:password@url. The server will capture the photo at the frequency you specify, however frequencies faster than 15 minutes require the StrandVision Linux Digital Media Player. 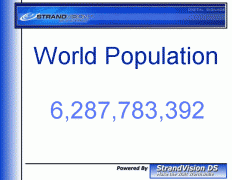 This is an optional add-on service provided by StrandVision Digital Signage. 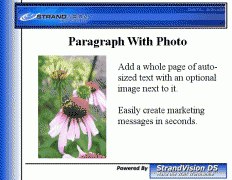 Display legal content from providers that StrandVision licenses as part of your subscription (ArtPlayer.com, clickvue.com, Hyatt People, StreamScreen.com, VF ImageWear Shipping Data). To learn how you can help get other content displayed, click here. This is an optional add-on service provided by StrandVision Digital Signage. 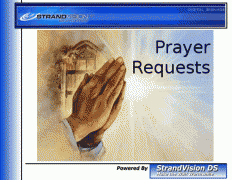 Displays public prayer requsts that have been submitted and moderated from Prayer.StrandVision.com. This is an optional add-on service provided by StrandVision Digital Signage. The Communications Campaign Library Designed for both employee communication and general public audiences the Communications Campaign Library motivates, educates and informs digital signage viewers while demonstrating your commitment to long-term and worthwhile green initiatives. Each theme includes 50+ attractive, impactful animated messages that are randomly selected. $category$ will be replaced with the trivia category if found in the title. This is an optional add-on service provided by StrandVision Digital Signage. The Current Time page displays the current date and time on the screen. This is an optional add-on service provided by StrandVision Digital Signage. The Count Up/Down page displays a message before and another message after the current date and time. 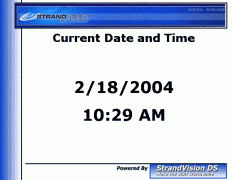 This useful for announcing the time until a meeting starts or the time since the last accident for safety reporting This is an optional add-on service provided by StrandVision Digital Signage. The Estimate Counter page calculates a number in real time to display informative information. Use it to show estimated electrical usage, population growth, people dying from smoking, etc. This is an optional add-on service provided by StrandVision Digital Signage. Automatically display visitors or employees from one of your custom people databases (most often a staff list for employee communication and motivation). This is an optional add-on service provided by StrandVision Digital Signage. The User Database Counter page reads all records from one of your user databases. Each line is displayed in a table format and the number of months, days or hours since the database date displays in real time. If there are too many database records to display on one screen, the information will scroll. This is useful for automatically showing plant safety statistics for all departments on one screen. If you put $totrec$ in your title, it will be replaced with the number of records in your database. 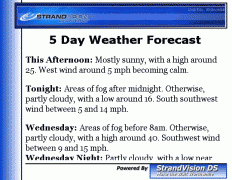 This is an optional add-on service provided by StrandVision Digital Signage. The User Database Table page reads all records from one of your user defined databases. Each line is displayed in a table format. If there are too many database records to display on one screen, the information will scroll. Database records that are old or new can be removed from the display if desired. If you put $totrec$ in your title, it will be replaced with the number of records in your database. 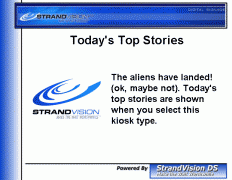 This is an optional add-on service provided by StrandVision Digital Signage. The User Database List page reads all records from one of your user defined databases. Each line is displayed in scrolling paragraph format. Database records that are old or new can be removed from the display if desired. If you put $totrec$ in your title, it will be replaced with the number of records in your database. This is an optional add-on service provided by StrandVision Digital Signage. Select a random record from one of your user defined databases (possibly customer testimonials). If you put `$totrec` in your title, it will be replaced with the number of records in your database. Entering `$currec` will display the current record number. This is an optional add-on service provided by StrandVision Digital Signage. 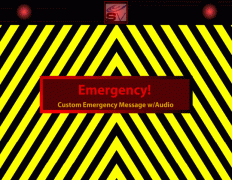 Announces an upcoming emergency of a user specified level and type. This is an optional add-on service provided by StrandVision Digital Signage. Allows playback of television channels or external video cameras (including web-cams) that are locally connected to the playback computer through a MSI Vox (or any Windows recognized) video capture device. This is an optional add-on service provided by StrandVision Digital Signage. Allows playback of streaming flash videos that have been processed by StrandVision for your streaming video add-on subscription This is an optional add-on service provided by StrandVision Digital Signage. Allows playback of random music videos provided by Promo Only in a specified subdirectory. This is an optional add-on service provided by StrandVision Digital Signage. 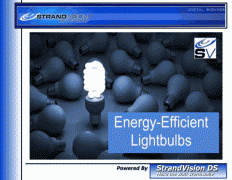 Allows you to select from PowerPoint files that have been converted with full animation to be used by your streaming video subscription This is an optional add-on service provided by StrandVision Digital Signage. Display a screen grab from a web enabled video or still camera. This needs the Linux PC if the camera is inside of your firewall. This is an optional add-on service provided by StrandVision Digital Signage. 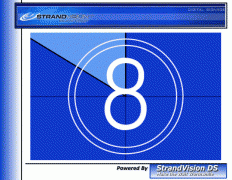 Display a short animation for StrandVision Digital Signage. This is an optional add-on service provided by StrandVision Digital Signage. The Hyatt Stock Price page displays the last price for Hyatt from the url http://investors.hyatt.com/phoenix.zhtml?c=228969&p=irol-stockquote. If you enter `$name` in the title, it will be replaced by the stock name. This is an optional add-on service provided by StrandVision Digital Signage. The TownCare Recognation page displays the current Recognation statistics from the url https://towncare.achievers.com/api/v1/program/stats/get/jsonp This is an optional add-on service provided by StrandVision Digital Signage. The Hyatt Meeting Rooms page displays today's meeting room reservations from the Envision Readerboard system which are active and set to publish for your Hyatt property. The following fields from the Title and subtitle will be replaced: $FACILITY$, $EVENTTYPE$, $FLOOR$, $GROUP$, $ROOM$, $DATE$ This is an optional add-on service provided by StrandVision Digital Signage. The Vigor Weather page displays the current weather info for Ketchikan, Seattle and Portland This is an optional add-on service provided by StrandVision Digital Signage. The Dynamite Oil Change Price page displays the current oil change price and low price user for the Dynamite Autos Service Saver system This is an optional add-on service provided by StrandVision Digital Signage.